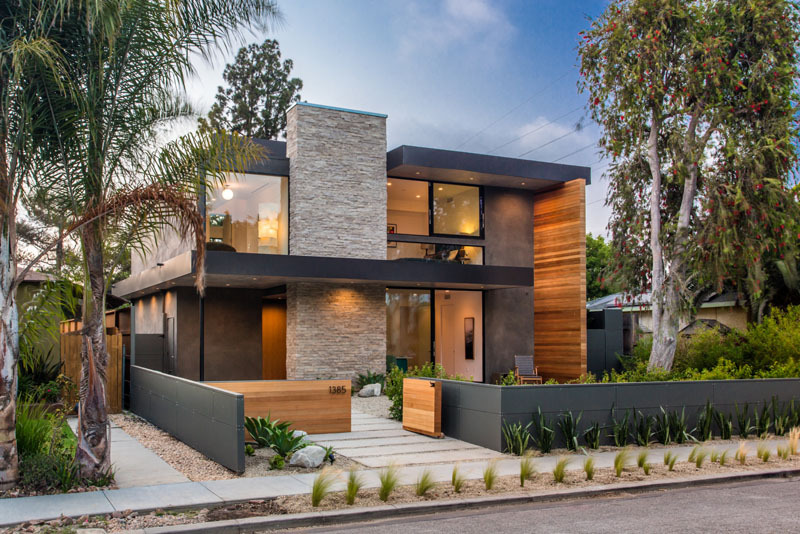 You'd love the layout of this beautiful modern home in California! Nothing beats a home with a beautiful outdoor area, exterior and interior design. When all of this is combined together, it results into a stunning residence that offers everything that the homeowners want. While some homes are not blessed with an outdoor space, there are residences that have beautiful pool area and garden which makes it very nice to stay and relax in especially on days when it is very stressful and you need a break. 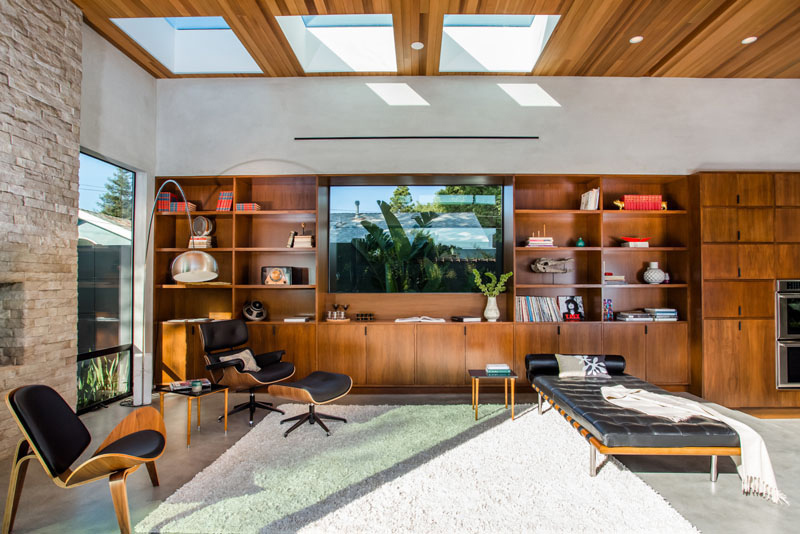 Today, we are going to feature a gorgeous mid-century modern house which has many impressive features in it. 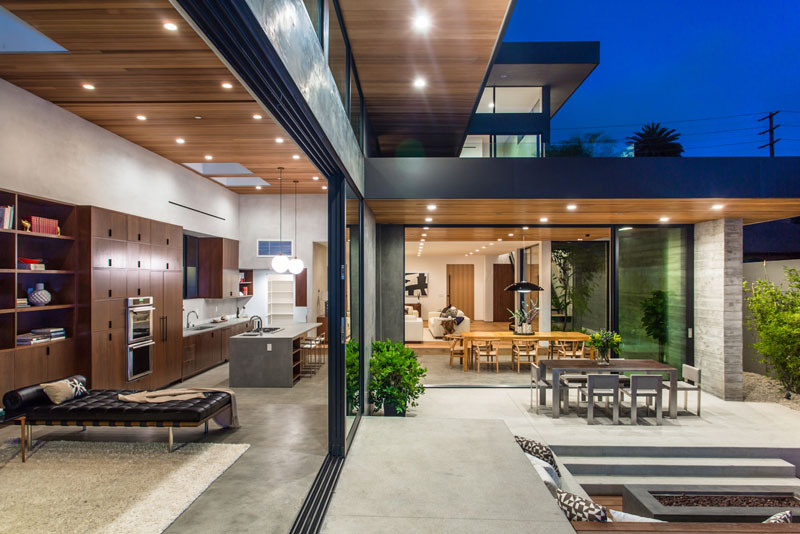 The Palms Residence was composed with an open floor layout that stretches out into a sweeping back yard with pool/spa, firepit zone and wood deck. The living spaces used modern materials that are warm, with earth tones in wood, solid, mortar and stone. Propelled by mid-century cutting edge outline, the drifting rooftop planes and dividers characterize the geometry from the outside, unfolding to the back yard on a sprawling straight parcel. On the inside, the floor arrangement is a play on closeness inside a bigger open space, with fluctuating levels in the floor and rooftop planes characterizing the living zones inside the entirety. It also has a beautiful design that looks very cozy. 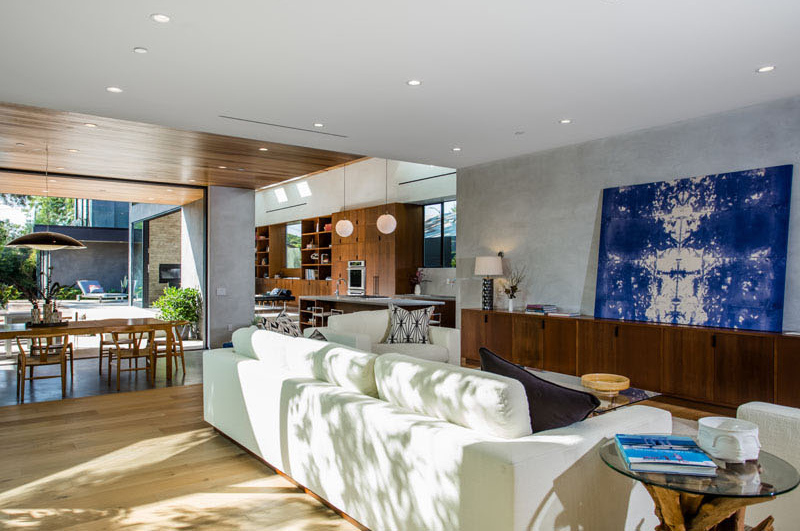 The living room, dining, kitchen and are outwardly associated and combine flawlessly with the open air spaces in a breezy indoor-outdoor living space. Unique feature: A lovely mid-century modern house that has a stunning exterior, a garden and everything that one needs for a comfortable way of living. 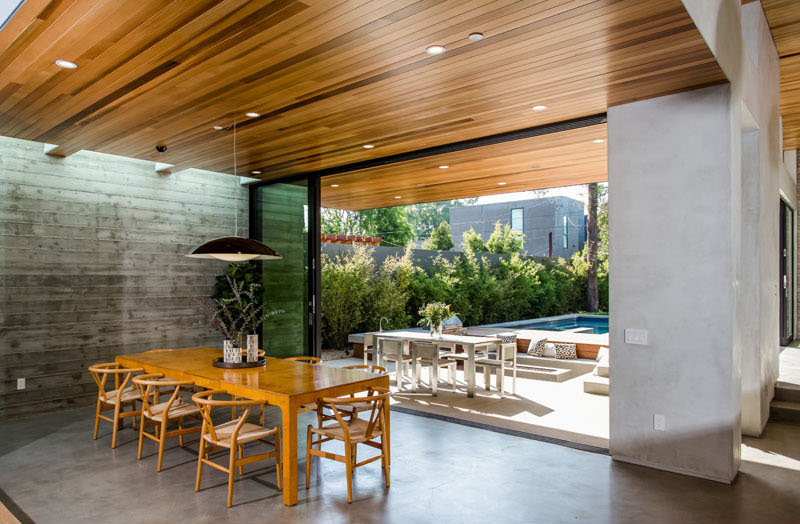 This home is located in Venice, California that features elements like a backyard guest suite, open-plan living, a swimming pool, and a sunken outdoor lounge. This is the pool area of the house that has a beautiful attractive design. By the pool is a two car garage that features a studio or guest suite. The exterior of the home is clad in black stained siding and there are also parts with stones and concrete. The pool area also uses different types of materials on it like wood and concrete. In the interior, the floor plan is open with the dining, living room, kitchen, and library all sharing the space. You can see here the sofa with lovely throw pillows and a wooden ceiling. Back into the main living area, it features a dining space, which is stepped down from the living room. It also has a wood ceiling that is featured through the main living area, and flows from the inside to the outside covered dining area. 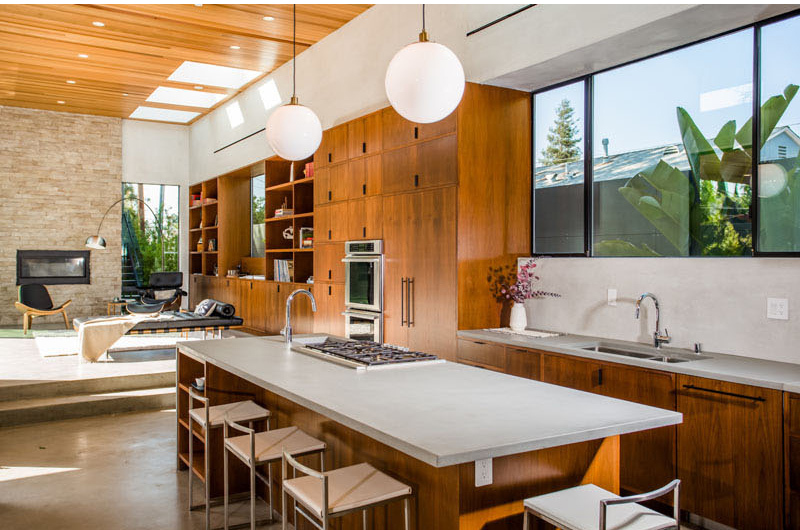 In the kitchen of the home is a light grey counter that matches the concrete floor, and wood kitchen cabinets that flow through to the library area. What you see here is the library where there is a fireplace with a stone surround. There is also a large sliding door that makes it the perfect place to lounge and get a bit of sun. Here’s a glimpse of a study that opens up to the front garden and it has a private patio with views of the neighborhood. In this area, you can really see how the home opens up to the backyard which creates a true indoor/outdoor living space. In the backyard, one can also see a swimming pool, outdoor dining area, kitchen, and a sunken lounge area with a surrounding a firepit. All of this is perfect for entertaining. One notable feature of the house is this steel, wood, and glass stairs that lead you to the second floor. At the top of the stairs, one can see a small sitting area with a large window featuring views of the street. 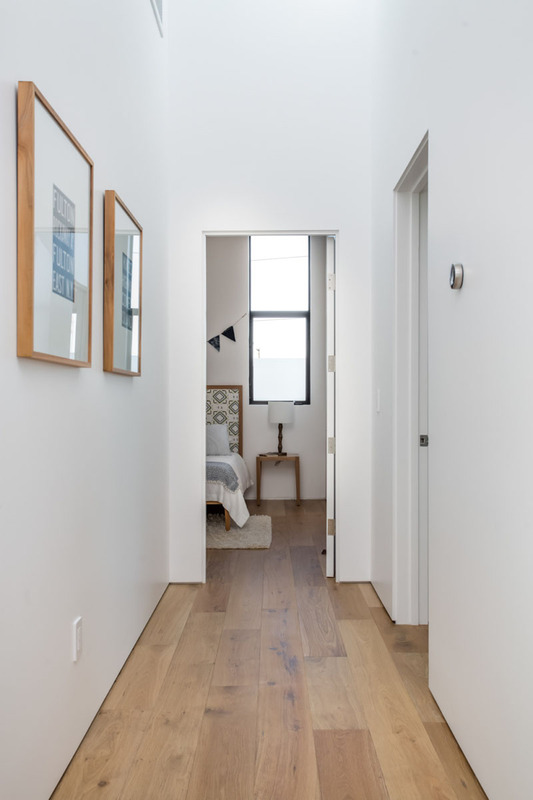 Concrete and French oak flooring is used throughout the home. Oak flooring in the upstairs hallway is also used here which continues into the bedrooms. 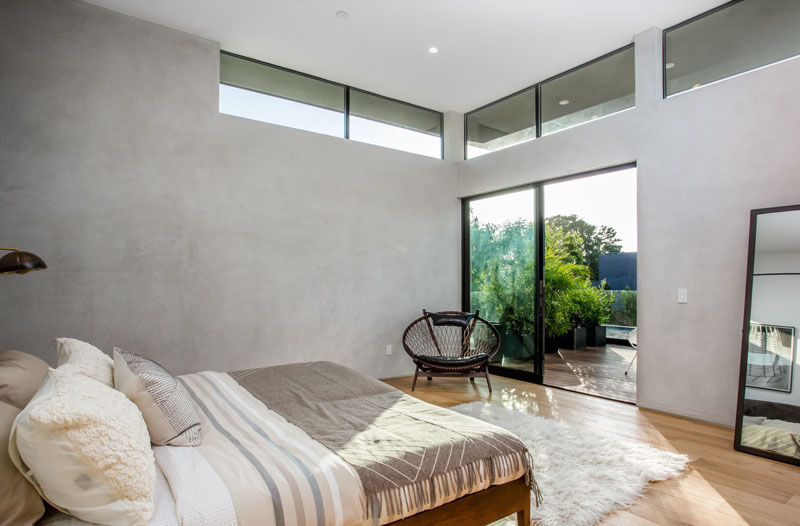 This bedroom has a beautiful and simple design that has large windows which provide plenty of light and views of the trees and street. 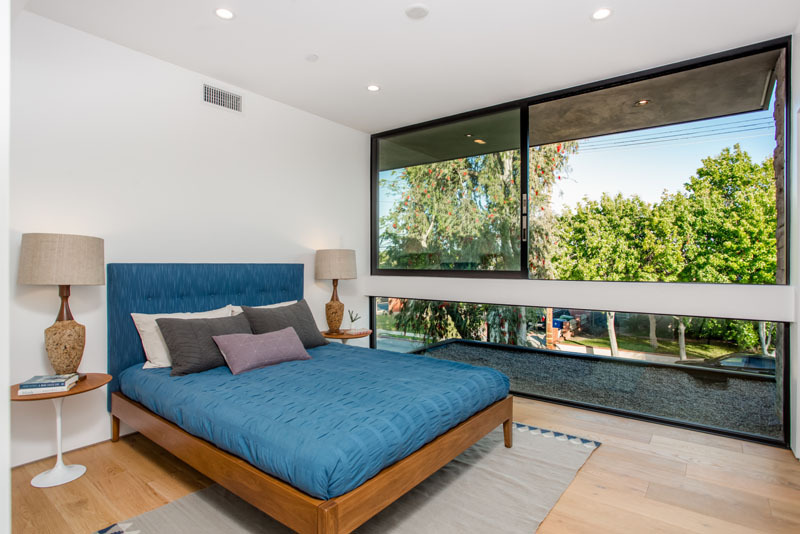 Another bedroom of the house has a built-in wardrobe as well as partially frosted windows that provide privacy to it. You can also see different textures in the space too and those buntings are so cute! 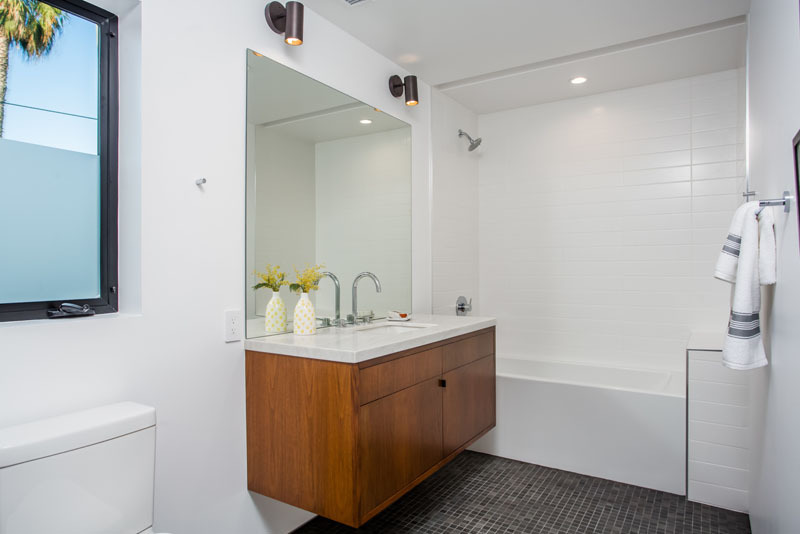 Seen here is one of the bathrooms that features a partially frosted window as well as a wooden floating vanity. 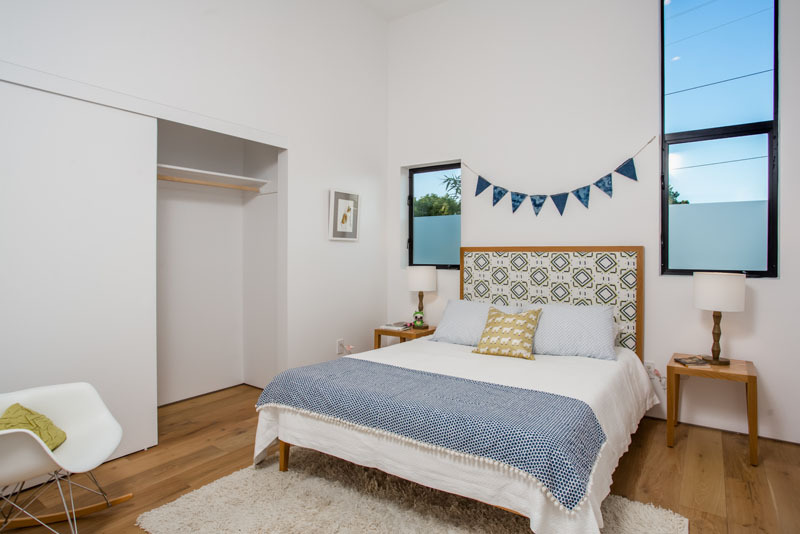 In the master bedroom, one can have access to a private balcony for relaxing in the sun. One thing I noticed here is the muted colors in the space. This is the ensuite bath which has a double vanity, bath and walk-in shower with built-in shelf.